Great interest and investment in electric vehicles is changing the future complexion of transportation and represents a significant demand for new products and services, including bi-directional information flow in AMI systems and smart charging systems. Today only 0.02% of light-duty vehicles are grid-connected, but most forecasts estimate ultimate penetration of this market at 8-16%, with some aggressive estimates at 37%, by 2020. AB 2565 - Rental property: electric vehicle charging stations - California law passed in August 2014 - Requires an owner of a commercial or residential property to approve the installation of an electric vehicle (EV) charging station if it meets specified requirements and complies with the owner's process for approving a modification to the property and makes a term in a lease of a commercial property, executed, renewed, or extended on or after January 1, 2015, void and unenforceable if it prohibits or unreasonably restricts the installation of an EV charging station in a parking space. Battery Exchange - Electric Vehicles are limited by the battery’s capacity and the time to recharge it. A battery exchange system is sometimes proposed as a solution; swapping a depleted battery for a fully charged one at an “electric filling station”. Battery exchange will work best when battery types are standardized and there is a relatively low number of vehicles. This model has been proposed for both Denmark and Israel and is part of the Project Better Place introduction strategy supported by Renault/Nissan. BDC - Battery Data Control - System that automatically adjusts charging rates to minimize charging time while maximizing battery life A maximum charge time is set as a backup to avoid overcharging. Incorporating battery power storage into current automobile frames will require systems to monitor the status of the battery including battery charge and temperature. Cell Reversal - Reversing polarity of terminals of a cell or battery due to over-discharge. Commercial Vehicle Depot Charging - It could be useful for the efficient operation of commercial vehicles to have access to three phase power for charging their high capacity batteries. The operational requirement for maximum usage of a vehicle will benefit from quick charge during a planned operational break such as reloading or driver lunch break. These connections should be available at most industrial or light commercial sites. Conductive Charging - Requires a connection via a plug like many household appliances. Deep Discharge - Discharge of the battery to below the specified voltage cutoff before the battery is replaced or recharged. DOD - Depth of Discharge - The percent of rated capacity to which a cell or battery is discharged. Normally stated as a percentage of the nominal ampere-hour capacity; 0% DOD means no discharge. DOD is the inverse of SOC: as one increases, the other decreases. While the SOC units are percent points (0% = empty; 100% = full), the units for DOD can be Ah (e.g. : 0 = full, 50 Ah = empty) or percent points (100% = empty; 0% = full). As a battery may actually have higher capacity than its nominal rating, it is possible for the DOD value to exceed the full value (e.g. : 52 Ah or 110%), something that is not possible when using SOC. Duty Cycle - The time duration and use frequency during which a battery is drained (i.e. 2 hours/day). connected in-line with the cord, and which can plug into a traditional 110 volt plug with a dedicated 15 amp circuit. Level II EVSEs need to be mounted and wired to an electrical panel at 220 volts. Several safety issues will require the use of EVSEs instead of simple cords that connect an outlet to a vehicle. Properly designed EVSEs will ensure that vehicles are properly connected and grounded before power begins to flow; they will prevent a driver from pulling away while the vehicle is still plugged in; and for batteries that have out-gassing, they will necessitate proper ventilation for charging. Fast Charging Stations - Require more complex chargers than currently deployed commercially. Larger commercial vehicles would prefer to have three phase (65 amp) charging to ensure a quick turnaround of delivery vehicles; this is widely available on commercial premises but not elsewhere. Building in quick charge capability to a vehicle will however add further costs. Typically quick charge could take a battery from 20% to 80% capacity in 10 to 15 minutes but with potentially significant impacts on the generation and transmission/distribution networks. These chargers will be designed such that they can detect battery cell chemistries to prevent damage due to an inappropriate charging profile. The problems of supply attendant with fast charging are discussed in sections 6 and 8; these problems could be overcome by the siting of a substation close to any fast charging station, or by local energy storage at the station. With the initial growth of EVs in city areas, well distributed fast charging stations will afford a high degree of security for nervous potential users. For EVs to expand outside city areas these stations are essential. of a complete charge in less than 10 minutes. Level III chargers will be significantly more expensive than Level I or II chargers and are expected to be available at commercial charging establishments. As an example, a Level III charger operating at 50 kW can fully charge a 24 kWh battery in approximately 25 minutes and could cost between $25,000 and $50,000. This happens to be about the same as the cost of a typical gas station pump. Fast charging rates will likely not be limited by the details of the standard, but rather by grid infrastructure capability and the tolerance of the battery chemistry. Home Charging - The most common location for charging an electric car will be at home utilising a 240V/13A or 16A connection. This will require a switchable socket and a surge protection device, but should not pose any problems for most homes. IEC 62196 - Standards for Plugs, socket-outlets and vehicle couplers - Conductive charging of electricity vehicles - Part 2: Dimensional interchangeability requirements for pin and contact-tube vehicle couplers. Standard allows a 1 or 3-phase current up to 250Amp. AC. IEC 62196-2 Type 2 - Europe has yet to agree on a regional plug standard, which has the potential to restrain a market of consumers that are likely even more motivated to buy plug-in vehicles than those in the United States. The IEC has been working on the 62196-2 Type 2 plug standard for several years. This plug would enable charging at either single phase or three-phase AC power up to 43.5 kW that is available in many parts of Europe. However, various camps in Germany, Italy, and France are at odds on the specification, and a June 2011 meeting to reconcile the differences proved futile. The German automakers are fairly unified around technology proposed by Mennekes Elektrotechnik as well as the European Automobile Manufacturer’s Association. Despite the lack of a European standard, EV charging infrastructure is currently being installed today, with hundreds of street-side charge spots that are “dumb” outlets that provide the available power from household current without the additional safety or smart charging features that will benefit consumers and utilities in North America. The German contingency also wants a single plug standard that could handle fast direct current (DC) charging as well, which would result in a fairly large connector that some view as too unwieldy for consumers to safely operate. In Japan and the United States, automakers and equipment manufacturers believe that two charge ports on the vehicle, (CHAdeMO for DC charging, and J1772 or an alternative plug for residential charging) is acceptable to consumers. Inductive Charging - Requires no direct plugged connection, only proximity. Inductive charging carries a far lower risk of electrical shock, when compared with conductive charging, because there are no exposed conductors. The ability to fully enclose the charging connection also makes the approach attractive where water impermeability is required; for instance, for electric hygiene devices, such as toothbrushes and shavers, that are frequently used near or even in water. Inductive charging makes charging mobile devices and electric vehicles more convenient; rather than having to connect a power cable, the unit can be placed on or close to a charge plate. The main disadvantages of inductive charging are its lower efficiency, higher cost and increased resistive heating in comparison to direct contact. JEVS G105-1993 (Japan Electric Vehicle Standard) from the (JARI) Japan Automobile Research Institute which was the basis for CHΛdeMO Level III charging. Tokyo Electric Power Company (TEPCO) has developed patented technology and a specification for high-voltage (up to 500 V DC) high-current (125 A) automotive fast charging via a JARI Level-3 DC fast charge connector. 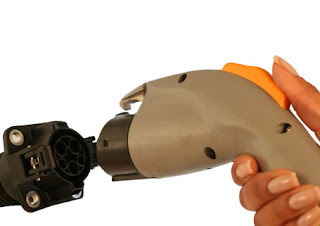 Level I Charging System – Uses the traditional 110 volt outlet. Though relatively slow, it may be sufficient for many PHEV owners. Level II Charging System -Specified at between 208 and 240 volts (the voltage used in many homes by clothes driers, ovens, and well pumps). The longer charges required by larger EV batteries will likely convince many consumers to opt for higher-power Level II charging. Level III Charging System - 480 V DC 125 amps. Also known as Fast Charging, Level 3 facilities utilize direct current. Most electric vehicles (EVs) have an on-board charger that uses a rectifier to transform alternating current from the electrical grid to direct current suitable for recharging the EV's battery pack. Cost and thermal issues limit how much power the rectifier can handle, so beyond around 240V and 75 Amp it is better for an external charging station to deliver direct current (DC) directly to the vehicle's battery pack. Level III will allow a fast charge for a driver who forgot to or was unable to charge overnight, or who is travelling beyond the range of the vehicle without the time to stop and wait for a slower charge. Level III chargers will also likely need to be deployed along intercity roads to provide charging opportunities for longer trips. While Level 1 and Level 2 charging uses the standard SAE J1772 plug, standards for Level 3 are under development. Overcharge - The forcing of current through a cell after all of the active material has been converted to the charged state. Over-Discharged - Discharge past the point where the full capacity of the cell has been obtained. Primary Battery Detection - Primary batteries are not designed to be recharged. Many chargers can detect a primary battery and then terminate the charging process. Public Charging Points - For practical and peace of mind reasons the abundance of public charging points will be important. There are a number of potential methods for charging for their use including an annual fee with free access or charging by the unit of time used. These chargers will need to be deployed both on streets and in car parks. Other areas of consideration are charging access for blocks of flats and work based charging. Charging points, like water and power distribution networks and telecommunications networks, could be designated as regulated assets, typically enabling the service provider to cover installation and operating costs and achieve an adequate return on their investment. This could be an incentive for utility firms to install them. Rated Capacity - The average capacity delivered by a cell or battery on a specified load and temperature to a voltage cutoff point, as designated by the manufacturer; usually an accelerated test approximating the cell or battery’s capacity in typical use. Roaming - The ability to charge at different locations. The capability for the electric vehicle to charge as easily as a gas powered engine will be critical to mass deployment. This can be enabled by the Electric Vehicle but needs participation of a Clearing House and a nationwide effort on a common standard. SAE J1772- A North American standard for electrical connectors for electric vehicles. It covers the general physical, electrical, communication protocol, and performance requirements for the electric vehicle conductive charge system and coupler. The intent is to define a common electric vehicle conductive charging system architecture including operational requirements and the functional and dimensional requirements for the vehicle inlet and mating connector. The Standard defines Level I and Level II charging as well as the interface between the vehicle and the EVSE. Level I and Level II charging utilize the same plug that actually plugs into the car. What is different is how those plugs are connected to the grid. SAE has also defined direct current (DC) fast charging, commonly referred to as Level III charging. The connector is designed for single phase electrical systems with 120V or 240V such as those used in North American and Japan and is designed to support electrical current up to 70A. The round 43 mm diameter connector has five pins and supports communication over power lines, to identify the vehicle and control charging. The standard also provides for a proximity detector that will detect a plugged in coupler even if the charger is de-powered, to help prevent the vehicle operator from driving away with the coupler still engaged. Performance requirements include impact resistance and a life- span of 10,000 cycles. SAE J2293 - Standard for Energy Transfer System for Electric Vehicles - In addition to the specifications defining the physical connectors, interfaces, and power levels, SAE is also developing specifications that will govern the communication between vehicles and the grid. This standard defines all characteristics of the total EV Energy Transfer System (EV-ETS) necessary to insure the functional interoperability of an EV and EVSE of the same physical system architecture. The ETS, regardless of architecture, is responsible for the conversion of AC electrical energy into DC electrical energy that can be used to charge the Storage Battery of an EV. SOC – State of Charge - Condition in terms of the rated capacity remaining at a given point in time. The SOC is typically stated as a percentage. SBS - Smart Battery System – A specification for determining accurate battery readings. It allows operating systems to perform power management operations based on remaining estimated run times. Through this communication the system also controls the amount the battery is charged. Communication is carried over an SMBus. Three Phase Power - Three circuit conductors carry three alternating currents of the same frequency which reach their instantaneous peak values at different times. It is the most common method used by grids worldwide to transfer power. It is also used to power large motors and other large loads. Fast charging using three phase power may not be possible for most cars, but it could be desirable for larger vehicles such as vans and buses. 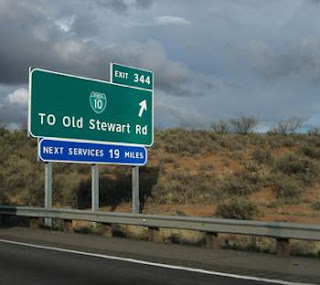 TSE - Truck Stop Electrification - Allows truck drivers to turn off their engines and plug into all weather electrical and communication outlets during mandatory rest periods. This reduces fuel costs, toxic exhaust emissions, maintenance costs and provides a better night's rest. PHEV battery charging will need to take place at a number of disparate locations – home, work, public car parks, and on-street. Smart metering will need to be widely available to optimize energy draw from the grid and enable the vehicle user to select the most cost efficient charging. This will enable the network to predict off peak requirements and to recognize and bill individual users. So far, charging points are in an early stage of their development. Charging Stations will not only need to be designed and manufactured in high volume, but they will need to be installed, networked and maintained. Where is charging infrastructure required? It may mean swapping batteries at your local service station just like people now swap propane tanks to power their grill and for the same reason—to avoid the fill-up wait, which might be hours for a battery. The hardware cost is fairly straightforward. A standard 110-volt station costs $1,200, while a 220 charger costs $2,500. (Fast DC chargers will likely cost more.) The cost will be paid up front or might get baked into a service contract. Installation adds additional costs, which will be overseen by third parties. The cost varies by geography: Arizona will likely be cheaper than San Francisco because homes are newer, already have robust residential wiring (thanks to the need for air conditioning), and a lower cost of living. The system is a combined charging approach that integrates all charging scenarios into one vehicle inlet/charging connector and uses identical ways for the vehicle to communicate with the charging station. Agreeing upon a single, harmonized DC fast charging system will help infrastructure planning, reduce vehicle complexity and improve the ownership experience for electric vehicle customers. Improved Charging Efficiency – Current technology performs more work and uses less energy than with yesterday’s charging technologies. Cost Effective Commercial Vehicle Charging Points - The availability of charging points is unlikely to be an issue for commercial vehicles where charging can take place at the depot, but there are a number of challenges for cars. Lower Up-front Cost - With the battery separated from the car, the down payment and resistance toward going electric goes way down. When you buy a Toyota, you don't buy eight years of gasoline. Since the battery accounts for about one-third of the cost of an electric car, the sticker price will be far lower than competing cars sold with batteries. Battery Degradation- Consumers don't have to worry about their battery degrading. In fact, their cars will stay younger longer because Better Place will circulate newer, longer-lasting batteries into the fleet. Regulatory Framework - One looming -- and possibly contentious -- issue is whether or not charging companies will be regulated as if they are utilities. Recently, Michael Peevey, the president of the CPUC, has signaled that that the CPUC may be inclined not to regulate these groups. California utilities are split on this question; PG&E, SCE and Sacramento Municipal Utility District claim that the charging providers are utilities, while San Diego Gas & Electric has stated that they should not be regulated. Consumer Confidence - In order for users of EVs to feel confident about purchasing vehicles and undertaking journeys, they will need reassurance that sufficient street parking/charging is available. Given the average journey length of 9 miles and that 93% of journeys are shorter than 35 miles, many cars will only occasionally use charging points away from their homes but, in order to have confidence in the vehicles, it will be important that public points are widely available. Range Anxiety - The current practical EV range limit is about 75 miles. Although this is sufficient to cover over 93% of all two-way journeys made, this is only about one fifth of the range of current ICEs. Consumers will have to adopt new “refueling” regimes and be prepared to have to wait considerably longer than current refueling times to enable continued use of their vehicle or to hire a long range ICE vehicle when needed. Li-ion batteries will continue to develop, offering higher energy density resulting in increased ranges to ease this problem. It is generally thought that electric cars with a comparable capability to current ICE vehicles will need a technological breakthrough, possibly only appearing towards the end of the time frame considered in this study. Until then there will be a degree of user anxiety regarding range surrounding whether there is enough charge left to complete their journey, but this should ease with familiarity and improved capability. Private vs. Public Charging - Government agencies need to walk a fine line in building out the electric vehicle charging infrastructure; too little public charging, and people may not buy the vehicles. But if people get used to charging for next to nothing, private charging networks may not get off the ground. The government is keen on eliminating “range anxiety” — the fear that an electric vehicle might run out of battery power before it can be recharged — that could discourage consumers from buying electric vehicles. But if charging is readily available for free or at very low cost it could discourage the private sector from getting involved. The actual cost of the electricity to recharge a vehicle is on the order of $1 or so, depending on where you live. Charging equipment companies such as Coulomb want to sell to retail establishments, such as restaurants, shopping malls, and parking garages that would recoup their investment by charging access fees. To date there’s been little investment in private charging stations, which is understandable as the vehicles won’t arrive for another year. At $3,000 or more for a charging station, it will take a lot of vehicle charge sessions to recoup the investment. If people can charge at home for less than that or at free public stations, they may balk at having to pay several dollars for a charge. Therefore, privately owned stations could have a hard time attracting customers, or may only be able to charge a buck or two, which could make it very challenging to turn a profit. Plug Access - Not everyone has a socket — a secure place to park their car and recharge it. Those living in apartment buildings, for example, lack this ability. Even where a plug exists, it may not have sufficient amperage to handle the load. Charging at parking bays is more likely to be during the day and therefore electricity charges would be greater. This would be an incentive for most to only charge back at home overnight, however, in areas of high density housing there is minimal dedicated parking and overnight charging will pose a significant problem. If this has to be done at a parking bay it could be a major disincentive. With limited off street parking available in cities, roadside charging points will be required to enable overnight charging and some fast charging capability in sufficient numbers to ensure their availability. Limited availability of charging points would create a supply restriction of the market. Connection Standards - While Level I and II standards have recently been adopted in North America, there is not yet a standard for Level III charging. What does the connection between the car and the socket look like? Can it be standardized across vehicles? Doing so would avoid the rat's nest of incompatible connectors that we've come to expect from cell phones. And such connections will need to carry more than just electricity. They'll also need to enable smart communications, such as the ability to sell energy back to the grid, which involves billing or financial transactions. Incompatible connections may be fine for a phone, but not for a car, where a universal connection standard — akin to computers' USB cables and plugs — would ensure that any vehicle could connect to any plug, anywhere — and do so safely and durably. In Europe, various camps in Germany, Italy, and France are at odds on the specification, and a IEC 62196-2 Type 2 meeting in June 2011 to reconcile the differences proved futile. The German automakers are fairly unified around technology proposed by Mennekes Elektrotechnik as well as the European Automobile Manufacturer’s Association. Despite the lack of a European standard, EV charging infrastructure is currently being installed today, with hundreds of street-side charge spots that are “dumb” outlets that provide the available power from household current without the additional safety or smart charging features that will benefit consumers and utilities in North America. Billing - Models for the settlement of PEV charging and discharging pricing, costs, and cross-utility payments are developing slowly, with significant technical and policy/regulatory unknowns. Proposals range from complex schemes for billing back to the driver’s (or the owner’s) home utility, simple charging as with current gasoline stations, to mixtures of prepaid and billed services as with cellular phones. When charging stations are ubiquitous, these issues will become even more important. Safety Issues with Inductive Coupling - It is a safe assumption that any sizeable charging scheme would use inductive coupling. Trying to design connectors to do all: handle high power, have many cycles, work in an outdoor environment, and be cost effective is a tall order for a galvanic approach. Long Residential Charge Times - In the US, 240V residential service is split phase (two 120V single phase lines that are 180 degrees out of phase from each other). Getting three phase service into a residence only serviced by single phase could be extremely expensive, so the bulk of three phase charging stations will probably be at places that already have the service - restaurants, shopping centers, hotels, etc. Economics of Charge Stations - A profitable business model for public charging infrastructure has not been reliably demonstrated. The only way for consumers to recover the cost of an expensive battery is to defray it over time with comparatively cheap electricity. This upper bound on the price consumers are willing to pay to charge their vehicles, and the readily available substitute of home charging, places an upper limit on what consumers will be willing to pay for public charging. PHEVs require new supporting infrastructure, such as charge stations. Economies of scale for these services may or may not exist. The uptake of EVs and PHEVs is unlikely to be uniform across cities, neighborhoods or even streets, but charging points will need to be in place ahead of market uptake as no consumer would buy such a vehicle if they are unable to easily recharge their vehicle. Therefore a degree of under-utilization of charging points would be expected as the market develops. Current charging points cost between $8,000 and $12,000 to manufacture and install and this represents a significant cost which would need to be recouped within any business plan. Infrastructure for High Charging Rate - Fast charging will require an on-board charger capable of accepting higher rates of charge, which would be an additional cost on the vehicle. The problem with the idea of rapid charge / discharge for things like cars is the total amount of energy and therefore power required. Residential charging is fundamentally limited by the distribution networks in neighborhoods. Anything much more than 4kW on a wide scale would require new transmission infrastructure. For locales where a lot of power could be concentrated, heating becomes the next big issue. Recharging a totally electric car with decent range is a 30kWh - 50kWh proposition. Try and compress that into 10 minutes and the charging power rises to the neighborhood of one quarter megawatt. Thank you but I will personally stand at a safe distance from any machine delivering those kinds of power levels. The amount of power loss in wiring grows as the square of the current, which is to say the inverse square of the charging time. Power loss drives temperature rise almost linearly. Safe power levels are limited by wiring insulation, and current ratings. The latter a function of the wire diameter and acceptable temperature rise. The amount of total energy loss in wiring for a single charge up cannot be reduced below inverse proportion to the charging time. Under optimal conditions, charge up 10kWh pack in 10 minutes has one half the total energy loss in the wiring as doing the same thing in 5 minutes. real conditions, the losses grow at an even higher rate. How will the capital costs associated this EV build-out be recovered from ratepayers? Limits to Fast Charging - Even if the supply power can be increased, most batteries do not accept charge at greater than their charge rate ("1C"), because high charge rate has adverse effect on the discharge capacities of batteries. Safety - 10 minute charges for a 200mile range translates to delivery of approximately a quarter MW. That's not easy, but from a power delivery standpoint perhaps possible. It is still a very dangerous power level. If a safety switch malfunctions, inopportune energizing could take out a pacemaker, or literally slam someone holding the device into the side of the car or other nearby ferrous metal. As dangerous as quarter MW levels are to charge in minutes, charging in seconds would require multi MW levels that I just don't see happening. Industrial electrocutions run about 700 per year. This is in a controlled environment with personnel who are supposed to be trained. Gas stations have trouble enough keeping the credit card readers working. Complex, systems involving high power delivery present very serious and difficult: safety, reliability and cost challenges. Roaming - Vehicle roaming within and across utility regions. Identification of vehicle ID to premise ID for automated billing –Volt owner directly billed for electricity used. Applies in multi family dwelling, public and workplace charging environments –Potential for 3rdparty aggregator. Fear, Uncertainly and Doubt. - It's just plain weird to buy a car but lease the most expensive component. Nissan recently announced it would initially not try battery rental strategy in the U.S. with the Leaf, due to negative response to the concept in customer surveys. Americans hate renting. Graduating from renting an apartment to buying a home has become enshrined as hallmark of adulthood. And if there's one thing we hate more than renting, it's sharing stuff with strangers. Who had this battery before me? Is that smoke coming from the hood? The first time someone gets in a bad accident or the car conks, watch them blame it on some stranger's battery. How will this impact the resale price of the car? What if Better Place goes out of business? Is this like getting a car from Hertz? You might pay more money and feel cheap at the same time. Battery Removal - The battery pack for an average passenger car will weigh 250 to 300kg. To provide good weight distribution and thus safe handling of the car, the battery pack could be specifically designed for that vehicle and therefore integrated into the structure. If this were the case then to change the battery pack will be far more time consuming and difficult than those we are used to in our current ICVs, and will require specialized handling equipment. Safety – The electrical connection between the battery and the vehicle carries a very high current, and it is this connection that would need to be made and broken each time the battery is exchanged. At best, it will cause wear and degradation at the key link between the two components, at worst; it has the potential to cause a massive discharge, with all the consequences that might ensue. Inventory Stocking Costs - The battery pack shape and the electrical architecture is likely to be unique to each vehicle, unless standards were introduced; so every exchange station would have to carry a considerable stock of fully charged batteries even to support the most popular vehicle models. This would entail considerable financial outlay, which would have to be paid for by the end user. Hostility from Car Makers - The battery is one-third of the price of an electric car. That means car manufacturers only get to sell two-thirds of a car, leaving them and their dealers less wiggle room for haggling and making a profit. That should really warm car makers up to this. Car manufacturers -- on the whole, a conservative lot -- also worry about safety, warranties and design homogenization. Future Government Support - The only direct federal support for deployment of charging infrastructure, however, was a short-lived ARRA-funded Transportation Electrification Initiative, which provided $400 million to several communities to expand charging infrastructure in 2009. Close cooperation between manufacturers, utilities, battery suppliers, the government and consumers. Battery exchange would require a high level of vehicle standardization. The development of charging infrastructure will need to keep pace with the developing market to ensure consumer confidence in the ability to recharge their vehicles with minimal inconvenience. There should be standardization of recharging systems to maximize commonality and minimize development of manufacturer specific systems. On street charging will be necessary to encourage EV and PHEV uptake and regulated asset status for charging points would aid their deployment. Estimates are that 80 percent to 85 percent of charges will occur at home. As a result, a substantial portion of the charging market will likely revolve around hardware sale. Should there be a statewide EV rate? How can EV prices be made simple and clear for all customers? Should EV load be separate from the household load (and the block/tiered pricing schemes in place)? Will a separate meter be required? Can a foundation for the vehicle-to-grid concept be put in place right from the beginning? 8. Companies Global sales of electric car charging stations was just $69 million in 2010, but analysts predict the EV charging industry to swell to $1.1 billion by 2013 — and even though they won’t have any plug-in vehicles ready until 2012, the world’s largest automaker wants a piece of it. Toyota and a growing number of electrical heavyweights including Siemens and GE are jumping into an industry of many small and medium-sized companies. And because of the sheer size, brand recognition and distribution networks that these new players bring to the table, the cottage industry surrounding electric car chargers is abut to get a serious shock to its system. 350Green - Founded in Washington, DC in June 2008, and now headquartered in Los Angeles, CA - It specializes in planning, site selection, engineering, construction, and marketing of the plug-in electric vehicle charging infrastructure. The company offers infrastructure for charging electric vehicles; and provides access to the network of charging stations located in public areas, parking lots, garages, and other locations accessible to drivers. It serves consumers, businesses, retailers, commercial property managers and developers, municipalities, and other hosts of EV charging stationsIt was an initial partner in The EV Project, a $230 million private public-partnership for the installation of charging stations in US cities. ABB, a large power and automation equipment conglomerate, announced in July 2011 that it has acquired Dutch EV charging company Epyon Power. Epyon, a spin-off of Delft University of Technology, provides DC charging stations and supporting network software. One of Epyon’s electric charging patent applications ’048 Application “Electric charger for an accumulator or battery” is directed to an electric charger for rapid charging. ABB also invested $10 million into Ecotality in January 2011. In May 2012, ABB entered the US market for electric vehicle charging solutions with the launch of its best-selling Terra 51 direct current (DC) charger, marking the start of a infrastructure rollout that will drive the adoption of electric mobility. The Terra 51 will be manufactured in New Berlin, Wisconsin and is available for delivery in the second half of 2012. Aerovironment , Monrovia, CA- As the leading supplier of fast charge systems for industrial electric vehicles (EVs), AV has applied its unmatched battery and charge system expertise to improve electric and hybrid electric vehicle productivity and performance. Their electric vehicle charging solutions only account for 15% of their 2015 sales, a proportion that has been slowly declining over time. With their high-margin and high-growth drone business showing strong revenue growth, it remains to be seen if they have the ability or desire to turn around this declining business line. ClipperCreek - Auburn, CA - The first on the market with high-rate charge stations that is compatible with all major automakers' Plug-In Hybrid and Electric Vehicles. In September 2016, ClipperCreek, Inc. unveiled the Share2 enabled HCS-40.. Share2 allows two electric vehicle charging stations to share power from one branch circuit. Share2 is an option for the Level 2, 240V ClipperCreek HCS-40 product line. A bundle of two stations enabled with the Share2™ is priced starting at $1,498. The Share2 is an inexpensive solution for any location looking for an easy way to double the number of charge points without running additional 240V circuits. ChargePoint (cool-ohm), Campbell, CA - Formerly known as Coulomb Technologies, changed name to ChargePoint in 2012. Car Makers: BMW, Cadillac, Chevrolet, Energica, Fiat, Nissan, Mercedes-Benz, smart USA, Toyota and Volkswagen. Car Charging Group (OTCMKTS:CCGI) Miami Beach, FL - Installs and manages electric vehicle charging stations. It was founded in 2009. It has offices in New York City, New York, San Jose, California, and Phoenix, Arizona; CarCharging’s business model is designed to accelerate the adoption of public EV charging. It has over 13,500 charging stations in the U.S. This over-the-counter company acquired 4 of their competitors including ECOtality’s network of charging stations shortly after they went bankrupt. The problem is that this network doesn’t appear to be making much money. In looking at their financials, it appears that each station generates on average $27.51 per month or less than a dollar a day. They recently raised institutional funding, strengthened senior leadership, and they have an established relationship with Nissan. They now need to ramp up their revenues and stimulate their share price which is down -57% over the past year and sitting near 52-week lows. 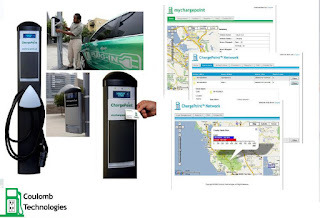 Ecotality (NASDAQ: ETCY) San Francisco, CA - Ecotality hoped to generate revenue from four sources: hardware and equipment sales, monthly subscription fees from consumers and fleet owners, advertising at the charging stations, and grid services to utilities. This OTC company wants to use solar in combination with an electric vehicle charging station. In addition to their “solar tree” product, in 2013 they launched the world’s first fully autonomous renewable car charger which is fully mobile. As of their last 10-Q filing, they had $78,467 of cash on hand. Revenues for the first half of 2015 were $700,000 with losses of $1 million. During the three months ended June 30, 2015, they successfully delivered 11 EV ARC™ charging units of which 3 were delivered under a 12 month lease agreement. The latest filing also has some of the usual peculiarities we see with OTC stocks. The Company apparently leases a pickup truck from the CEO for $1,850 a month plus mileage. GE Wattstation - A version of the GE WattStation a Level 2 (240V) device designed for home use --launched in April 2012. GE has partnered with ServiceMagic, a leading website connecting consumers with service professionals, to provide a network of certified electricians for reliable installation of the electric vehicle charger in the home. GE Capital, working with ServiceMagic, will provide financing options to qualified customers, enabling customers to pay for the charger and installation costs over time. The wall-mounted device, costs about $1,000 plus installation. WattStations will rely on PayPal as the exclusive payment provider. PayPal will be embedded in the WattStation Connect mobile app, available now for iOS and Android, and will also soon power an RFID payment card. WattStation Connect app users will be able to find nearby WattStations through the app, get directions and check the availability of the station. To pay, they will scan a QR code on the machine to identify the WattStation and pull up pricing information. Then they’ll select how they want to pay, either by a flat rate or pay as you charge. Users will complete their transaction through PayPal and can begin charging. NRG eVgo (pronounced ee-vee-go) - Houston, TX - The first U.S. commercial chain of charging stations. It is owned by NRG EV Services, a subsidiary of NRG Energy, one of the largest electricity providers in Texas. The EVgo® network is the largest public Fast Charging network in the nation. From April 2014 to October 2015 their chargers provided enough kWh of electricity to power 12,323,090 EV miles. EVgo’s infrastructure is invested across the country right now in more than 55 markets. EVgo drivers can access more than 1,000 charging locations, along with individual charging stations at homes, schools, offices, multi-family communities and hospitals across our growing network. The eVgo network consists of two types of charging stations: 480-volt DC rapid chargers, which take about 30 minutes to recharge an electric vehicle, and 240-volt Level 2 chargers, which take about four hours to recharge a vehicle. The eVgo "Freedom Stations" are 24 hours a day, and offer both types of chargers. Customers of eVgo pay a flat monthly fee of $49 to $89, which can allow access to charging stations both at home and on the road. For the higher levels of membership, customers can get free power from their home chargers during off-peak hours. NRG Energy was obligated by a legal settlement to invest $100 million in battery electric vehicle (BEV) charging infrastructure in California. According to NRG Energy, these investments resolve “all outstanding claims and disputes” pertaining to litigation between Dynegy, bought by NRG Energy in 2006, and the state, represented by the California Public Utilities Commission (CPUC), over unsatisfactorily fulfilled electricity contracts during the 2000-01 energy crisis. The stations will be owned and operated by NRG Energy and be much like theAeroVironment-built stations in NRG’s Houston charger network. They will be credit- and debit-card accessible. Plug-in vehicle drivers will have both pay-as-you-go and subscription access. Pay-as-you-go prices will be no more than $15 per charge during peak demand periods and $10 per charge during off-peak hours. A $9 million investment in advanced BEV charging technology and BEV car sharing programs. The investment will move the technology forward and expose more people to it. A total of $5 million will go to develop battery storage for peak demand periods, very high power charging capability, or for vehicle-to-grid pilot programs. The other $4 million will go to EV car sharing programs and job training programs in the charger infrastructure field. 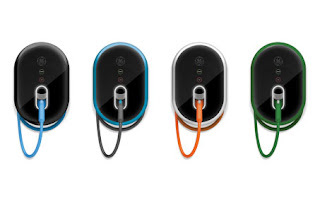 Schneider Electric , a €19 billion French company and a world leader in active energy management solutions, launched its own residential charger EVlink™ in February 2011 that includes a delayed charging option and an LED display. On May 7, 2012, Schneider announced U.S. availability of its new EVlink DC Quick Charger for EVs. Schneider says users can charge 80% of their EV battery in less than 30 minutes using the charger. SemaConnect - Bowie, MD, Founded in 2008, SemaConnect has taken in $26 million in funding so far with their latest Series C round completed in July of this year. The Company has used this funding to deploy thousands of charging stations across the nation. Their focus is on the commercial and residential property market. In 2011,ChargePro saw their single largest order to date for 1,500 charging stations. Two ChargePro charging stations can be leased for a 5-year period at a cost of $258 per month for both. Siemens In February 20111, Siemens announced it is launching a charging point Charge CP700A on the European market which can charge electric cars with a normal battery capacity within an hour. The charging power has been doubled to 22 kW in the new series, which cuts the charging time in half. ShorePower (formerly ShurePower) Rome, NY - Designs, manufactures and operates transportation electrification equipment for: Truck Stops (TSE), electric Transport Refrigeration Units (eTRU) and Electric Vehicle Supply Equipment (EVSE). Shorepower Technologies is known best for its Truck Stop Electrification power service at over 1,800 parking spots at 62 U.S. locations, where long-haul trucks and refrigerated truck trailers can draw power from the grid rather than idle their engines when parked. Shorepower TSE allows truck drivers to turn off their engines and plug into all weather electrical and communication outlets during mandatory rest periods. This reduces fuel costs, toxic exhaust emissions, maintenance costs and provides a better night's rest. While not a pure-play by any means, we can’t fail to mention Tesla which provides their drivers with a nationwide network of “supercharger” stations free of charge. This means that the more market share Tesla captures with their vehicles, the more market share they capture for their exclusive electric charging solutions. If we assume 50,000 Teslas on the road in the U.S., then there are still 82% of electric vehicles that need to be charged somewhere. There’s always the chance that the Tesla “supercharger” stations could be enabled to support other electric vehicles but this seems unlikely. You wouldn’t want a Tesla owner to pull up to a fully occupied station and see non-Tesla electric vehicles which defeats the purpose of the “free of charge” value proposition. e-mobility Berlin was formed last year by two German industry giants, utility RWE and car manufacturer Daimler. Daimler plans to provide and service 100 Mercedes and Smart electric cars until the end of 2009, while RWE is handling the development of infrastructure and operation of the 500 charging stations. Daimler has been testing 100 Smart electric cars in London since 2007.